Cash is the lifeblood of any business, and even if a company experiences strong sales, it can run out of cash and go out of business if customers aren't paying fast enough or if cash outlays are outpacing inflows. That's one reason Brian Hamilton, chairman and co-founder of Sageworks, a financial information company, cautions young firms against automatically extending credit to customers. "The biggest challenge I've seen for fast-growth companies is that their accounts receivable run faster than their sales or their ability to collect," according to Hamilton. "Suddenly, you find yourself in the banking business to a certain extent. You could have -- and you do have -- cases where the company's growing, they're even profitable, but because they're not collecting their accounts receivable quickly enough, they go out of business or they have big problems." Some industries historically have high accounts receivable days -- a measure of how quickly they get paid by customers. 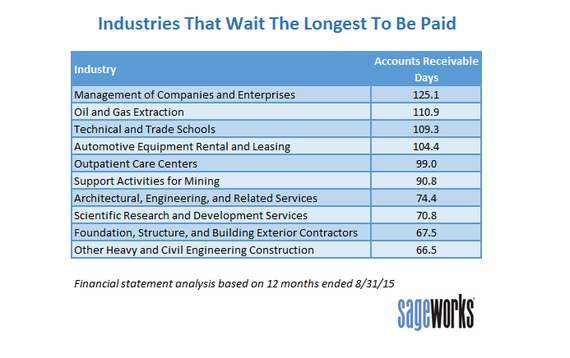 Sageworks recently conducted a financial statement analysis and determined the 10 industries that are typically waiting the longest to be paid. These industries had the highest average accounts receivable days over the 12 months ended Aug. 31. Industries with the highest average accounts receivable days for the 12 months ended Aug. 31: management companies, oil and gas producers, technical and trade schools, and auto rental/leasing companies. Outpatient care centers, architectural/engineering firms and foundation/building exterior contractors also made the list. 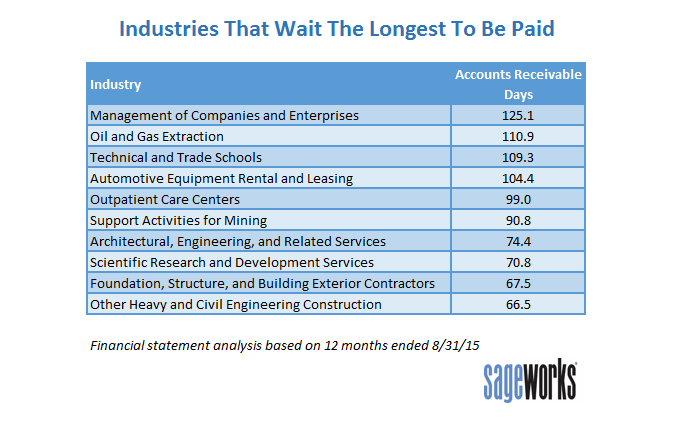 Among all industries, privately held companies have had fairly consistent collection timeframes over the past five years, with average accounts receivable days ranging from 35 to 40 days, according to Sageworks data. "Obviously, business owners would prefer to get paid quickly, but it isn't necessarily bad if an industry has a high relative number of AR days," said Sageworks analyst Libby Bierman. "This number is often a function of the business model and of expectations in the industry." Keep in mind, she added, that cash flow is not only a function of how long it takes for customers to pay. The speed with which a company pays its own vendors and cycles through its inventory also factor into cash flow generation, and many of these same industries have among the highest average accounts payable days, which means they take the longest to pay their suppliers. 1. Grant credit sparingly. Businesses should examine their credit policy and make sure there's a financial benefit to granting credit to the customer. Consider creditworthiness and the overall relationship with the customer before offering credit terms that won't adequately reflect the risk being undertaken. Consider varying credit terms among customers based on those risks and benefits. 2. Invoice accurately. Sending out an incorrect invoice is a near guarantee that payment will be delayed, so monitor invoicing procedures for accuracy. 3. Expect timely payment. This may seem obvious, but some business owners are afraid to ask for payment, worried they'll offend or alienate a customer. This can lead to customers being nonchalant about paying, so be clear in communicating payment expectations. 4. Apply late fees. Failing to receive payments in a timely manner will cost a business time, money and opportunity, since workers will be spending time making collection calls instead of trying to generate new revenue or otherwise add value to the company. By spelling out and applying consequences (fees, interest) for late payments, customers are more likely to get the message that they need to pay on time. 5. Monitor late payers. Run weekly reports on accounts receivable to raise awareness of overdue accounts and monitor the company's effectiveness at collections over time. Bierman said businesses should also gauge how their accounts receivable days compare with industry peers. "Peer businesses with lower AR days may be more efficient at collections than your firm, and that could provide opportunities for them to gain ground," she said. "Conversely, by putting into place proper controls for receivables, your business can ensure that collections positively affect cash flow and your market position." Sageworks, a financial information company, collects and analyzes data on the performance of privately held companies and provides accounting and risk management solutions.